Melissa Wurramarrba, Karmelina Daniels and Daphne Daniels are three Aboriginal women rangers working as a part of the Yugal Mangi Rangers programme in the Northern Territory of Australia. There they oversee tasks such as controlled burning of land to prevent wildfires, water and soil sampling and protecting areas from feral animals. "It is empowering to be women rangers," says Wurramarrba. "Before we used to stay at home, but now being a ranger is opening a new world--we're taking steps to make our communities more sustainable." From left to right: Karmelina Daniels, Daphne Daniels and Melissa Wurramarrba participate in the 2016 IUCN World Conservation Congress and share their learning as women rangers. Credit: Maggie Roth, 2016. Around the world, millions of women live in or near wetlands and protected areas--recognizing them as sources of food, livelihood, traditional knowledge, and spiritual retreat, among others. However, a recent Environment and Gender Information (EGI) platform analysis reveals that in two of the most influential conventions on protected areas and wetlands conservation, the roles and needs of women are largely overlooked in management plans and subsequent national reporting. The Ramsar Convention on wetlands and the World Heritage Convention on protected areas have established some of the first internationally agreed-upon practices for conservation and sustainable use of biodiversity around the world. 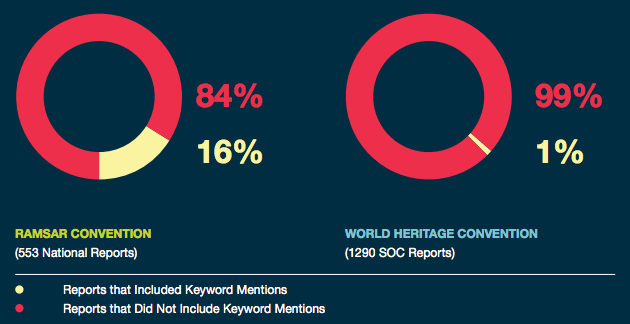 While both conventions are part of the United Nations and must follow global mandates on women's human rights, gender equality and gender mainstreaming, the EGI shows that only 16% of national reports submitted to the Ramsar Convention and only 1% of countries' State of Conservation (SOC) Reports submitted to World Heritage include gender keywords. Because women and men have varied reliance upon, control over and access to natural resources and differentiated responsibilities for protecting these resources, ignoring specific issues related to gender excludes women and ultimately prevents effective conservation, sustainable use and equitable management of protected areas. Some women rangers even think they are best suited to be the primary decision-makers for protected areas. "As women, we have more experience and knowledge than men about wetlands; the men, they don't share the community knowledge or talk about these issues. Women sit around and talk about these issues--we want to educate ourselves and our kids," says Daphne Daniels. Nearly half of the reports analyzed from both conventions that contained gender keywords discussed women as stakeholders on management committees or as one of many subgroups that were beneficiaries of education, livelihood and public participation programmes. Only 12 reports (0.7% of the total reports examined from both conventions) discussed women's capacity as agents of change to drive environmental and policy change, such as what the Yugal Mangi Women Rangers are doing. 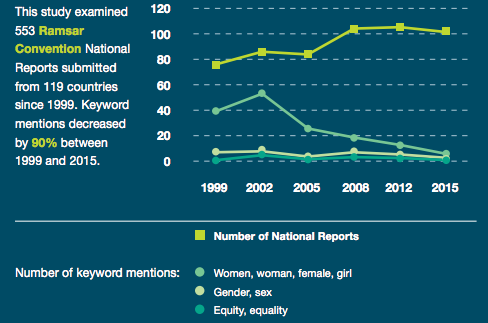 Digging deeper, the EGI reveals another worrying trend: over time there has been a decrease in gender keyword mentions in Ramsar National Reports: of 553 total reports submitted from 119 countries between 1999 and 2015, keyword mentions decreased by 90%. Formal policies and guidelines, such as Strategic Plans and Gender Plans of Action, are important entry points for ensuring that gender is mainstreamed throughout the work under different policies and conventions. Ensuring gender-responsive reporting mechanisms to the Ramsar and World Heritage Conventions provides the opportunity to enhance effective and equitable planning, management of and benefits derived from protected areas around the world. "I'm proud to be a ranger. Land means so much to us and we take responsibility for caring for the land," says Daphne Daniels. "As a woman, wetlands are our food source, our traditional knowledge, where we go to hunt and gather. Without wetlands, we can't survive." To learn more about GGO's work, or to explore further issues related to gender and the environment, please visit the GGO website and follow us on Twitter.